Yup, real life is cooler than the movies. Especially when that life is of a US Marine. 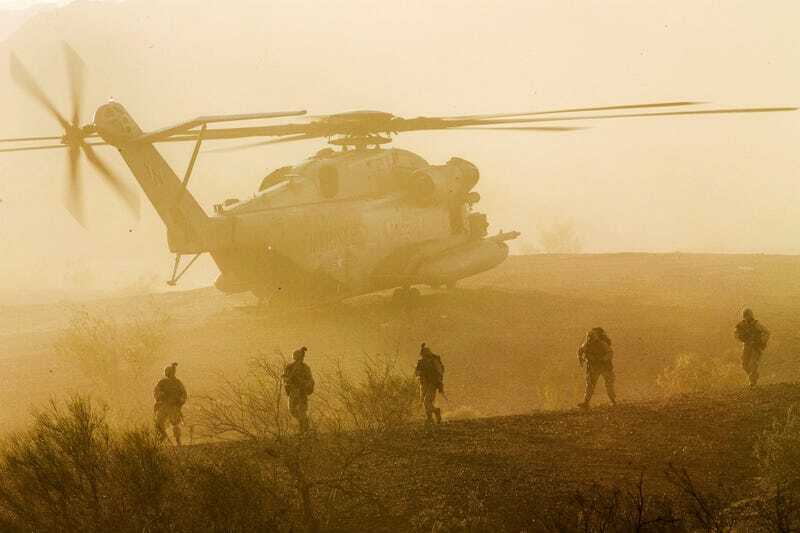 Here are five Marines walking away from a CH-53E Super Stallion helicopter in the desert in a training exercise. It looks more badass and perfectly picturesque than any still from a Hollywood military movie. Marines with 1st Battalion, 5th Marine Regiment, participate in a heavy helo raid during Weapons and Tactics Instructor Course 2-15 at K-9 Village, Yuma Proving Grounds, Arizona, April 8, 2015. The exercise is part of a seven-week training event hosted by Marine Aviation Weapons and Tactics Squadron One cadre. MAWTS-1 provides standardized tactical training and certification of unit instructor qualifications to support Marine Aviation Training and Readiness and assists in developing and employing aviation weapons and tactics.